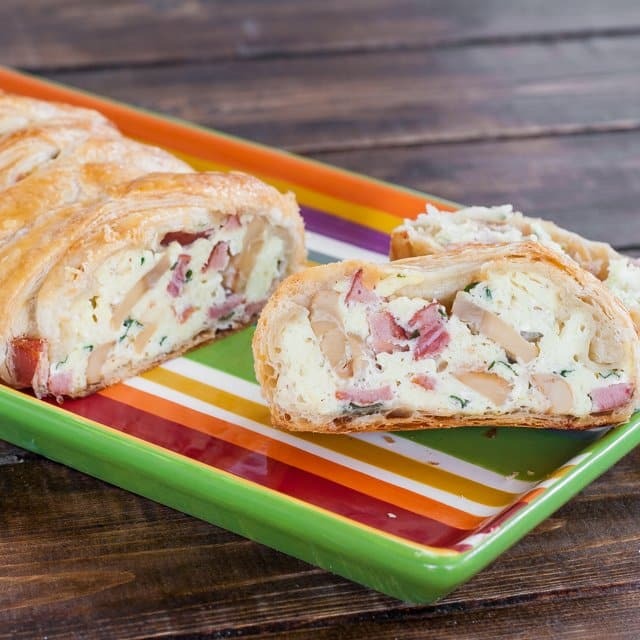 Scrambled Eggs in Puff Pastry – Scrambled Eggs with Kielbasa sausage, mushrooms and Swiss cheese in puff pastry. I have a great idea for you for the perfect weekend breakfast or brunch! 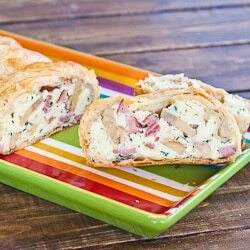 This scrambled eggs in puff pastry is super easy to make, and it’s very delicious. The best part about it is that you can add anything you want to your eggs. I chose to add some wonderful Kielbasa sausage I got from our local Polish store, Swiss cheese and mushrooms. It was so good and so filling, everyone enjoyed and it just looks like you slaved over this for a long time, when in reality, it can’t get any easier. 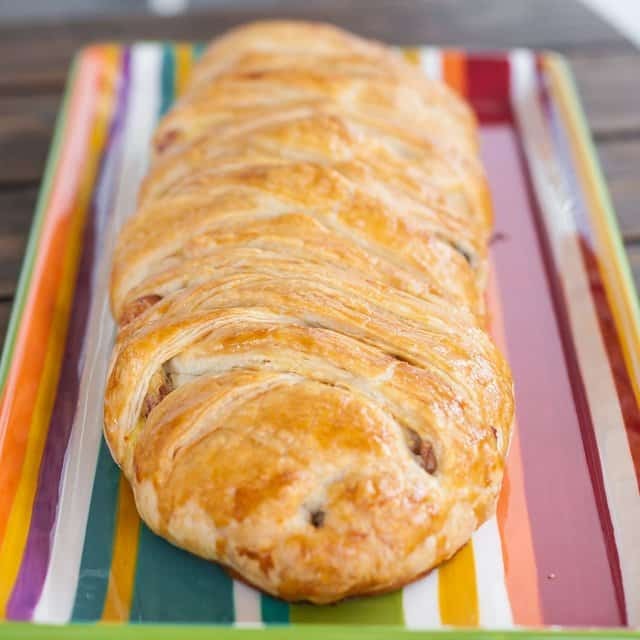 I know I’ve said before how much I love puff pastry, but I really do because it’s just so versatile. 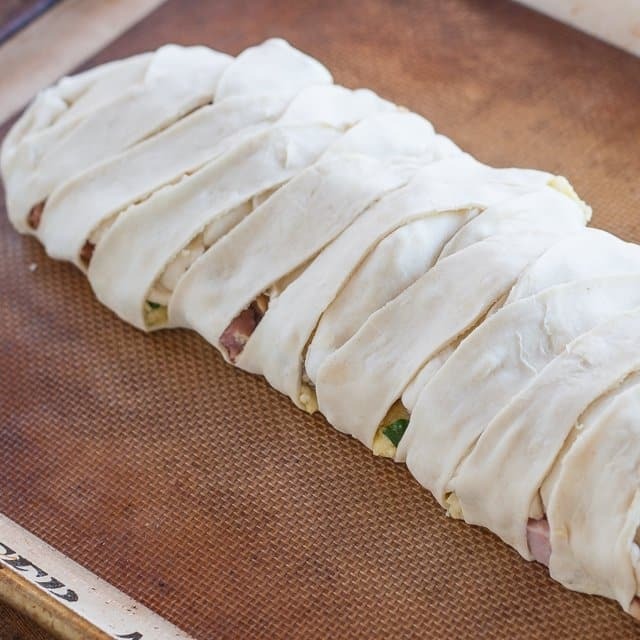 To get this going, you’ll need one piece of puff pastry. The boxes I get of puff pastry have two pieces inside, so just save the other one for a dessert. Roll out the puff pastry a bit, so that it’s about 18 inches x 14 inches. 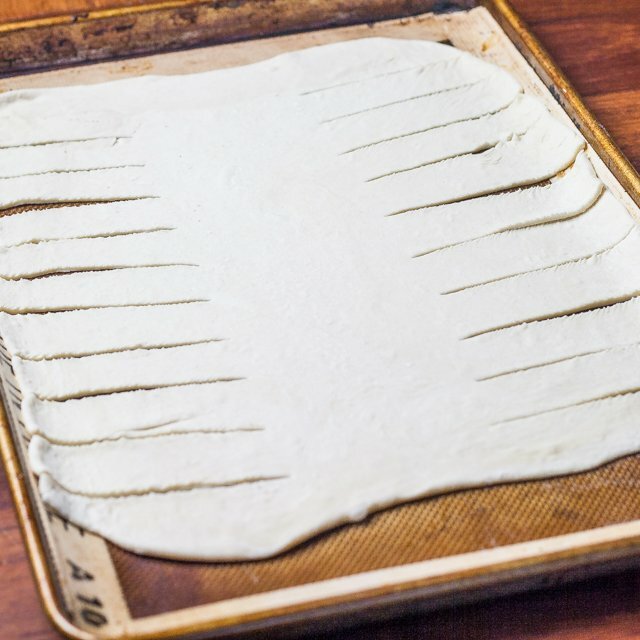 You’ll need about 4 inches down the center of the pastry, so start cutting 1 inch strips, leaving the 4 inches in the center. Set this aside. Next we can make the scrambled eggs. So add a tablespoon of butter to a skillet and melt it. Add the mushrooms and kielbasa and fry for a couple minutes. 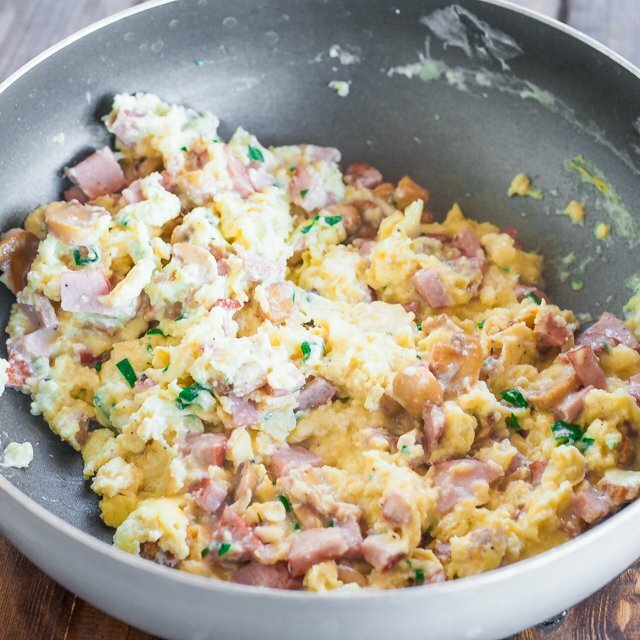 In the meantime, whisk together 6 eggs and mix with the shredded Swiss cheese. Add the eggs to the skillet and cook. I also added a bit of parsley for color and season with salt and pepper. Now the fun part begins. Take a strip from each side and fold over the eggs. One from each side at a time, sort of forming this braid. This makes the pastry look really fancy but it’s very easy to make. Brush the pastry with the egg wash and bake in a preheated oven at 375 F degrees for about half hour or until nice and golden brown. It looks amazing, and it tastes just as great. Great weekend breakfast idea. What’s your favorite weekend breakfast dish? Roll out the puff pastry a bit, so that it's about 18 inches x 14 inches. You'll need about 4 inches down the center of the pastry, so start cutting 1 inch strips, leaving the 4 inches in the center. Looks delish! Do the eggs dry out in the oven at all? Do the eggs need to go in a little wet? Thanks! No not really, but if you’re afraid of that, then just leave them a little more uncooked. I think this would be good with any kind of sausage. I would probably use a pork sausage in it. I think I am gonna try this one though looks delish and different! Wow! This looks like it would be right up my alley for a family breakfast! Curious though, would this work as a freezer type meal? 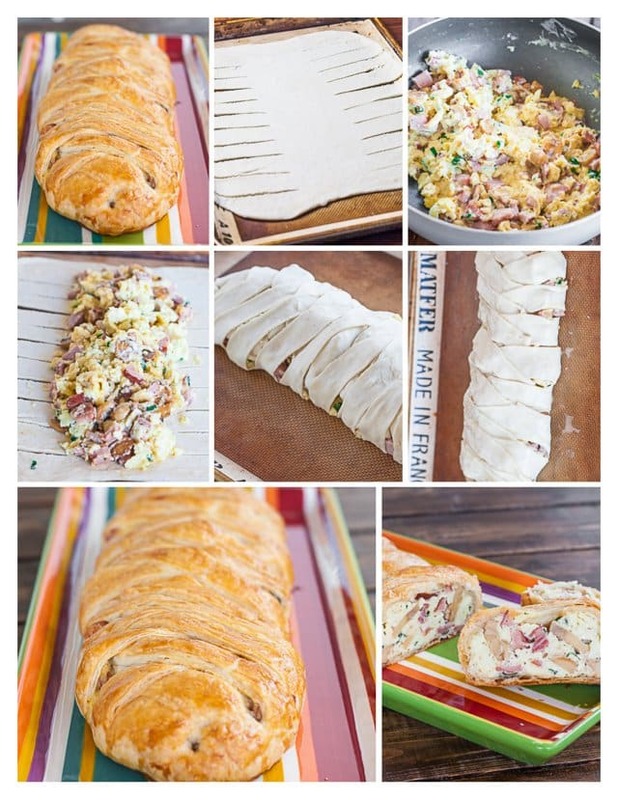 Something I could make, freeze, and portion off for school/work days? Thanks! I know it’s been a while since this was posted but I was wondering if I can make this the night before and just toss it in the oven in the morning? I’ve been searching all over the internet for a simple recipe… I’m a young mom, still newish to cooking, and I’m so glad I found this! My son and I will be indulging momentarily, all thanks to you. 🙂 only we are skipping the Ham and just going eggs and cheese. I’m glad you found me too, you’ll find lots of simple recipes here. This one is a great easy recipe, hope it turns out for you. Wonderful, I am going to give it a try: Portion sizes with salmon, spinach and scrambled egg. I can’t wait to make this as it looks so good & easy. I am an egg addict, heehee. Will make it, cut it up, freeze some and eat it every day until it’s gone!! Hi Patti, it is easy, you’ll love it. I found your blog from a friend linking your bourbon chicken recipe on Facebook, and I have this in the oven right now. I hope it’s as delicious as I think it will be! Such a wonderful idea, and the presentation is gorgeous! 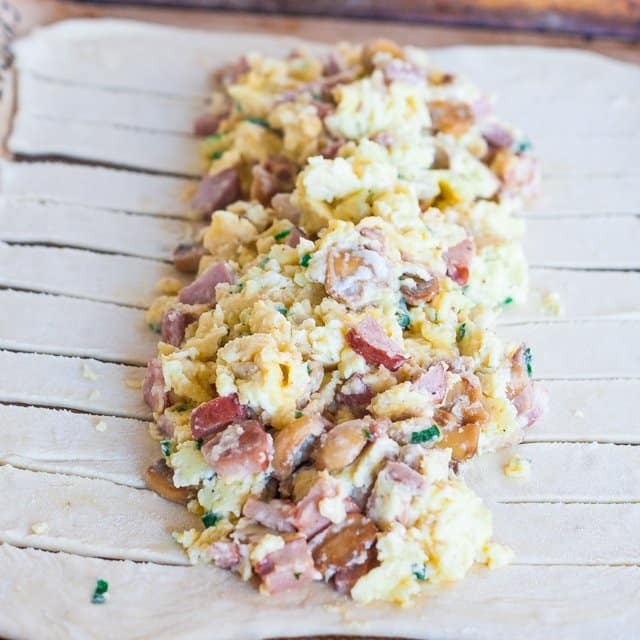 I love using oyster mushrooms when I make scrambled eggs… I imagine they would take pretty darn good in this pastry!